The snowboard World Cup has two new leaders following the capricious Moscow stage, which left Russian hopeful Ekaterina Tudegesheva off the podium. 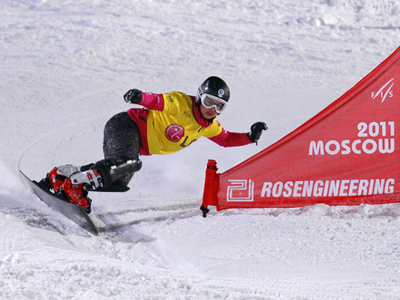 Moscow hosted a snowboarding World Cup stage for the third straight season, and every year new venues are used. This time a 56-meter-high, 175-meter-long ramp was erected near Luzhniki stadium. The leader of the standings coming into the event, Russia's Ekaterina Tudegesheva, was a hot favorite, but disappointed a massive crowd of fans with her worst performance of the season, finishing in 15th place. With last year's winner and World Cup holder off the slope, Patrizia Kummer from Switzerland and Austria's Julia Dujmovits confidently made it to the final. It was a neck-and-neck race as the Swiss took a narrow advantage in the first run and managed to extend it in the second to edge out her rival. The 24-year-old rider now tops the overall standings in the race for the Crystal Globe, while Tudegesheva dropped to fifth. In the men's competition the Russians performed much better, powering to the quartefinals. But it was last year's winner, Roland Fischnaller, who faced Simon Schoch from Switzerland in the decider. After a dominant performance in the first run, the Italian cruised to his fourth triumph of the season. The 32-year old leapfrogged Andreas Prommegger in the standings to take an overall lead. Moscow's World Cup stage made the headlines with new faces at the top of the standings, and with just two races left, the season is building swiftly to its climax.